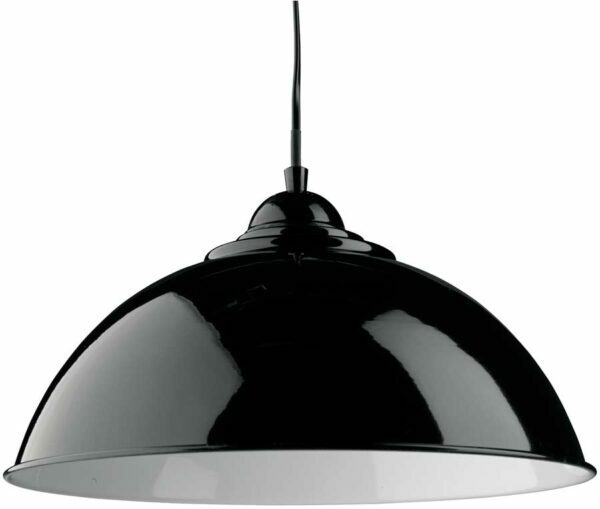 A retro pendant light with a domed, gloss black downward facing shade, matching black flex suspension and traditional circular ceiling mount. Looks fantastic mounted either singularly or in multiples over a kitchen breakfast bar or dining table and has a high gloss white coating inside the shade to help produce as much light as possible. Height adjustable at the time of installation by simply shortening the flex suspension to a maximum drop of 131cm. Other colours in the modern Sanford lighting range can be viewed below and include soft cream and bright red.